My mum is missing her dad today on Father's Day. He passed before I was born. She felt sad for a long time and then I came along and rescued her. I give her so much love and look after her when she's down. Not just when she's down about her dad but when she's down about other things too, which is quite often. We are soulmates, after all. And we understand one another deeply. So, I would like to wish Granddad a HAPPY FATHER'S DAY up in Heaven. Thanks for giving me such a special mummy! And Happy Father's Day to all dads everywhere! Happy Father's Day. Athena, take good care of your mum today and give her extra snuggles. Soul mate kitties - how would be survive without them? Happy Easy Sunday, Athena! And purrs to your human today as she remembers her dad. Athena you keep making your Mommie feel better and we wish your Grandaddy a big happy Father's day too. OMC! 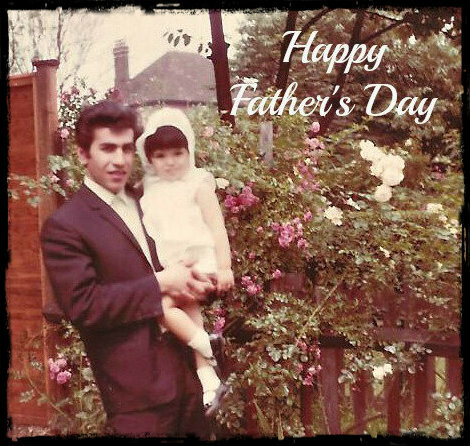 Your Dad looks like a young George Harrison! Happy Father’s Day to all the Dads. What a wonderful photo, and so kind of you to help your human, Athena. What a sweet photo of your momma and her dad! Purrs to your mom, Athena. And Happy Dad's Day to all the Dads. Hope you all had a fantastic Father's Day! What lovely memories in those photos. We hope your Mom's Dad had a great Father's Day in Heaven.